Clean water groups filed a lawsuit this week asking Washington's Thurston County Superior Court to overturn a state decision to renew a water quality permit for the Columbia River Generating Station, the Pacific Northwest's only operating commercial nuclear reactor. In their petition the groups say the permit, which was issued Sept. 30 and effective Nov. 1, allows the discharge of waste water that is in violation of state water quality regulations and a water intake operation that poses direct harm to fish species such as salmon, including stocks that are listed under the Endangered Species Act. They ask that the state court declare invalid the Washington Energy Facility Site Evaluation Council's recent decision to approve a federal Clean Water Act National Pollutant Discharge Elimination System permit for Energy Northwest's Columbia River Generating Station. Such permits are issued for a five-year time period. The approval renewed a permit last considered in 2006. The new permit does not comply with applicable requirements of state and federal law, the petitioners say, and thus should be vacated by the court. The conservation groups ask that the permit be remanded to the state agency for needed modifications. The Columbia Generating Station is a 1,170-megawatt boiling water reactor that uses nuclear fission to produce heat, according to a fact sheet generated as part of the WEFSEC consideration process. It produces eight to nine billion kilowatt-hours of electricity annually, representing 4 percent of the power consumed in the Northwest. The facility is located on the Columbia River about 12 miles upstream (north) from Richland, Wash., and 351 miles from the river mouth. The petitioners say the permit approval ignores expert advice from federal government scientists on potentially lethal impacts to threatened salmon. Northwest Environmental Defense Center, Northwest Environmental Advocates, and Columbia Riverkeeper filed the lawsuit against the EFSEC. The permit also allows the nuclear plant to operate a cooling water intake structure. The groups say EFSEC issued the permit over strong objections from fisheries experts at the National Marine Fisheries Service. The lawsuit also alleges that EFSEC's permit allows water pollution at levels that violate state standards designed to protect public health, fish, and other aquatic species. "Experts from the National Marine Fisheries Service sounded the alarm about how this facility may be killing and harming endangered salmon," said Marla Nelson, staff attorney for the Northwest Environmental Defense Center. "EFSEC's blatant disregard for this input demands judicial oversight." The Columbia Generating Station draws 20 million gallons of water from the Columbia River every day to cool the nuclear reactor, according to the conservation groups. In a series of letters, the National Marine Fisheries Service urged state and federal regulators to require modern water intake structures to protect threatened salmon from death or injury. In Feb. 28 comments submitted regarding the proposed permit, NMFS said that it disagreed with the EFSEC's determination that cooling water intake screens represent the best available technology to minimize adverse environment effects. "NMFS has extensive experience in fish exclusion and passage systems, has evaluated the CGS intake screen designs and supporting studies and has determined that they are notably out-of-date and would likely harm some of the juvenile salmon that encounter them," the NMFS letter says. The EFSEC and Energy Northwest deemed the existing screens adequate. "No adverse environmental impact has been demonstrated... . EFSEC believes it has appropriately considered the potential risks identified by NMFS and EPA in the context of the BPJ [best professional judgement] analysis and its authorities under the CWA. "EFSEC's best professional judgment determination is that the existing cooling water system intakes location, design, construction, and capacity represent the best technology available for minimizing adverse environmental impact and comply" with the CWA, the fact sheet says. The petitioners say that both EFSEC and federal Environmental Protection Agency have refused to follow NMFS' advice. 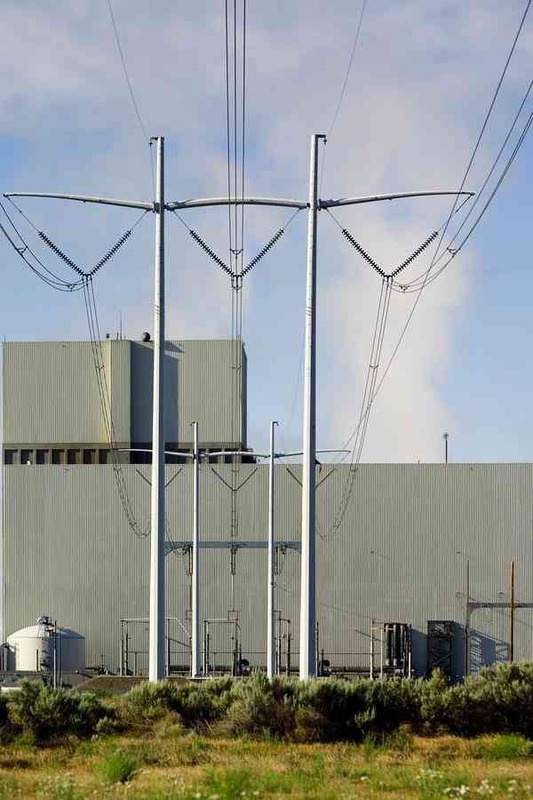 Energy Northwest has not been required to study the impacts of the intake structures or to modernize the structures since they were designed in the late 1970s, according to a press release from the groups announcing the new lawsuit. "This nuclear reactor is one of many sources of toxic chemicals that are contaminating the fish and wildlife of the Columbia River, including heavy metals from Hanford operations," said Nina Bell, executive director of Northwest Environmental Advocates. "State and federal agencies give a lot of lip service to protecting Columbia River water quality and species but when it comes to actually restricting the polluters, these same agencies are nowhere to be found," she said. The Hanford Reach supports some of the most productive spawning areas in the Northwest, including the largest remaining stock of wild fall chinook salmon in the Columbia River. The fall chinook salmon that spawn and rear throughout the Hanford Reach, where the generating plant is located, are caught by commercial, recreational, and tribal fishermen all along the Columbia River and the North Pacific Ocean. "People regularly eat salmon and other fish caught just offshore and downstream of Energy Northwest's facility," said Dan Serres, conservation director for Columbia Riverkeeper. "This is why it is imperative that the state of Washington comply with the law and protect our region's strong fishing heritage." The lawsuit, filed in Thurston County Superior Court, asks the court to invalidate Energy Northwest's water pollution permit. The conservation groups say that EFSEC failed to comply with multiple requirements of the Clean Water Act.